Community Colleges are unique in the arena of higher education. They accept all students from diverse social and ethnic backgrounds. No one is turned away, and they will succeed with hard work, perseverance, and a dedication to their personal and academic growth. At Solano Community College, seven out of every ten students are in need of financial support. Our nearly 14,000 students understand that education is their path to financial independence and future prosperity. SCC qualifies students for transfer to four-year universities at a fraction of the cost of UC and CSU; prepares students for jobs in nearly 100 career fields from biotechnology to auto tech, and provides basic skills education for those not yet academically prepared for college. The SCC Alumni Association is focused on the things that matter the most; helping alumni find quality jobs after graduation, connecting current students with employers for part-time work, and linking alumni with students for mentoring and job shadowing. Our work, our passion is a dedication to supporting SCC alumni, current students, and the College, not with a hand out, but with a helping hand up. Please help us make a difference today! 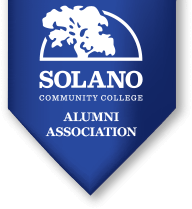 The vision for the SCC Alumni Association is to establish and maintain an organization dedicated to supporting SCC alumni, current students, and Solano Community College. Help alumni find quality jobs by encouraging local employers to hire SCC alumni and students for part-time jobs and internships. Help connect alumni with students for mentoring opportunities. Promote the College by sharing alumni success stories and highlighting achievements. Publicize College successes in the community. Build and maintain a social network and create fun events. Raise funds to support student scholarships the College. 2018 Gold Falcon Sponsors – Thank You!